I would not call it a resolution so much as a commitment to avoid hitting the grocery store 4 times a week picking up things for dinner. I am going to do my best to do meal planning for the week and buy as much as I could one day a week. Granted, I am usually at the store more than once if a blog post comes my way but those are in and out visits. (hopefully) Since our schedule has changed on Mondays I now have to make slow cooker recipes for dinner since we don’t get home until 7 pm. I adapted a slow cooker fajitas recipe this week and was a little nervous for the outcome: RESULT family asked to keep it on rotation once a week! 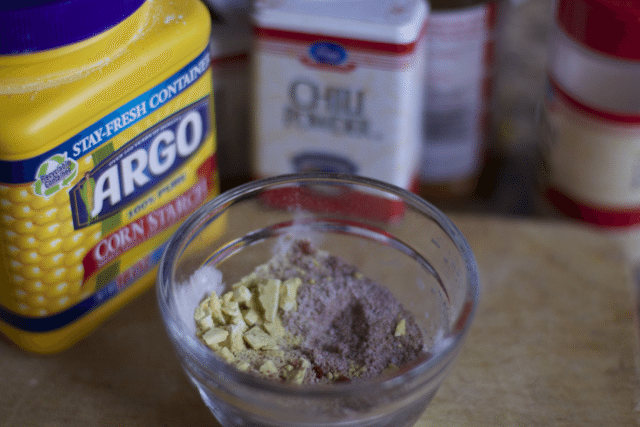 The original slow cooker recipes called for packaged seasonings mix. While this is a convenient option for many, I prefer making my own seasonings when I can so I can control the sodium, MSG, and spiciness in this case. You can make the seasoning the night before, even make a double batch to have on hand for the next fajita night. One recipe makes about 1 oz of homemade fajita seasoning, so I doubled the recipe for this slow cooker fajita dinner. In the morning, just throw in your flank or skirt steak into your crock pot. Cover it with the spices and then add all the peppers and onions you desire. Next time I will probably double the peppers since my family loves that part and it came out really well. 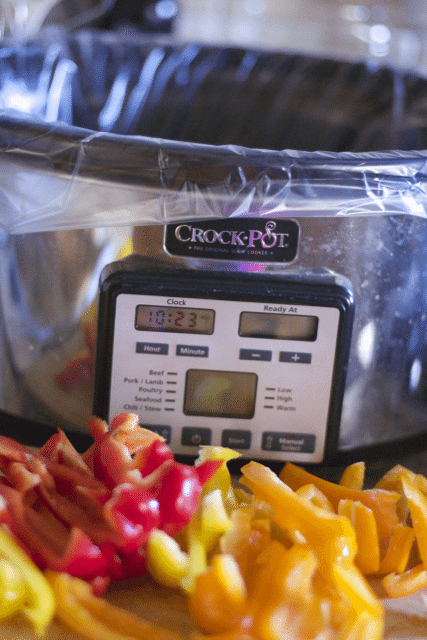 I used a slow cooker liner and boy does it make clean up for slow cooker recipes a breeze. Dinner preparation is pretty easy as well. 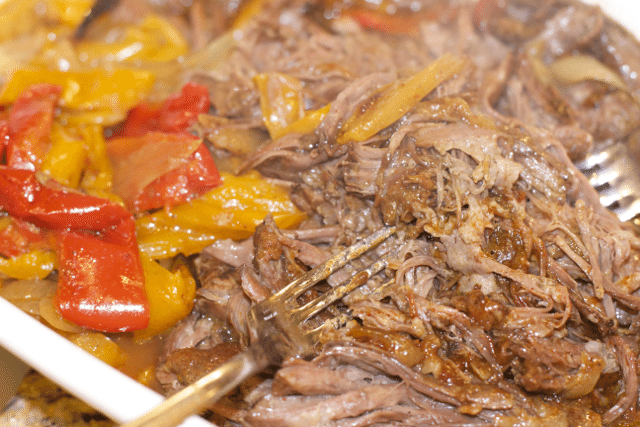 Take out the slow cooked and tender fajita meat with a slotted spoon and use two forks to break it apart. This is an easy task. Fish out the peppers and onions with the slotted spoon as well. Heat up some tortillas, we used white corn and serve with your favorite fajita toppings like sour cream, cheese, lettuce you get it. I made a quick rice and corn side dish. Dinner was served without the stress of the late hour rush and everyone so more than pleased with the result. 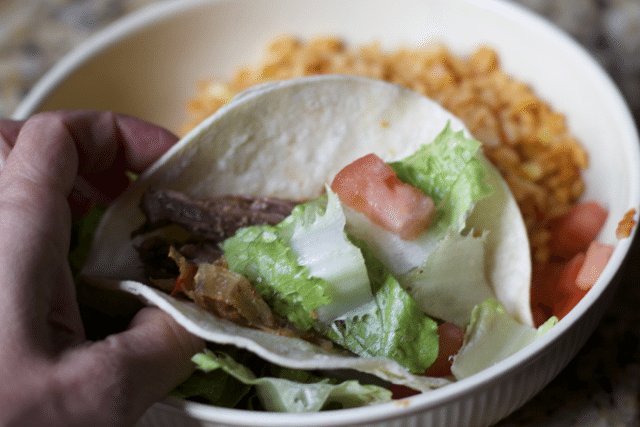 I never thought the slow cooker fajitas would be as good as those made on a grill, but when you need dinner ready when you walk in the door, this is the slow cooker recipe for you. I am going to try this with Chicken next time and maybe even a combo of steak and chicken… Possibilities are endless. For more of our fajita recipes check these posts. This makes around 1 oz of seasoning. 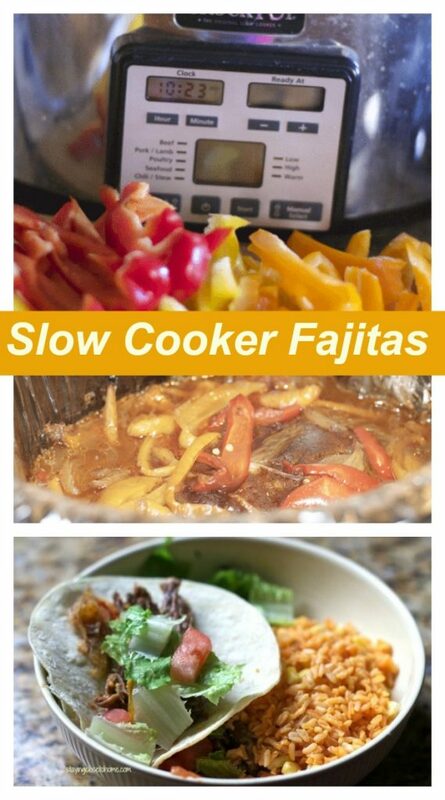 For this recipe for slow cooker fajitas you must double this recipe. I am going to need recipes for Monday nights, what are some of your favorite Slow Cooker Recipes? I’m always in favor of anything cooked in a slow-cooker. These look and sound great! I like all of the fresh elements as well! That looks great. Love them and will need to make it. I never would’ve thought to do this, what a great idea! They look amazing, and I’m always trying to find meals I can make in my Crock-Pot. We used our crockpot yesterday. It’s so cold here, that crockpot meals really hit the spot. I bet this would be well-loved here. Making a meal with Fajitas is a yummy idea. I like that you can make your own season mix with this one. Those fajitas look amazing! We love Mexican food! Love crockpot recipes. You guys rock!! That looks so delicious! We haven’t had fajitas in such a long time, but thanks to you, we may be having them this weekend! Thanks for sharing! delicious!! I love crock pot recipes and I am adding this one to my meal plan. This looks really good – I love all crock pot recipes – I wiill give this one a try! This looks really good. I love Mexican food. I so need to try this recipe. Oh yum I’ve never done this with a crock pot. This sounds like a great idea. All yeah, thanks for this recipe. I love fajitas and I love my crockpot so perfect combination. YUMMY!! and i like that I can do it in my slow cooker. Score one for this recipe. I’m all about the slow cooker! Printed this one- thanks! 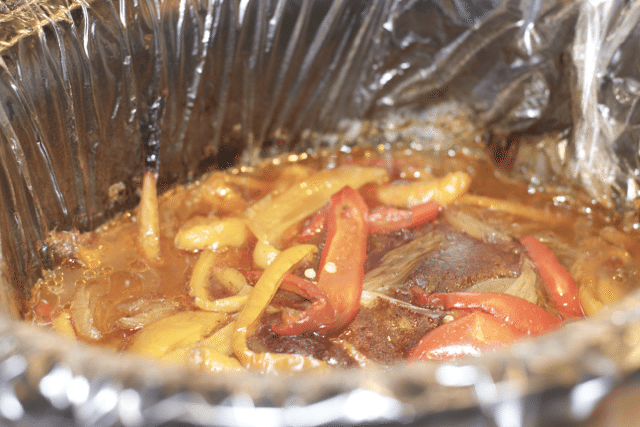 My all-time favorite slow cooker recipe is pot roast but these fajitas sound great! 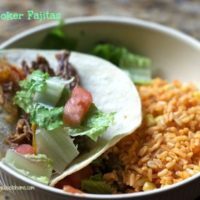 We love fajitas and I love anything I can make in the slow cooker! This is a must try! Delicious! I’d love to give these a try! We love Mexican food in our house, so I will definitely be trying this! They sound awesome. 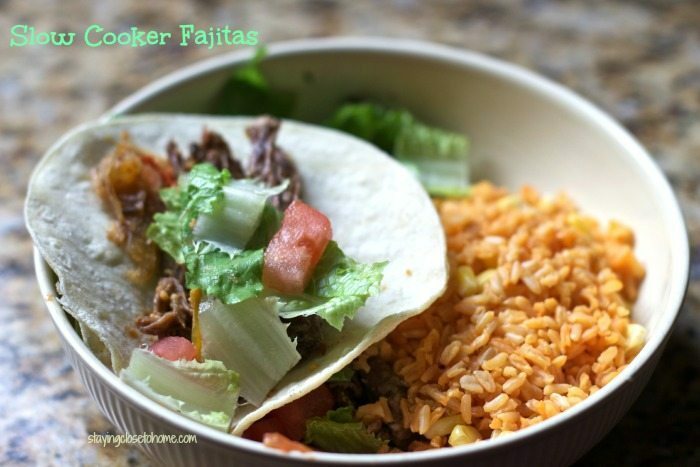 Wow, these crock pot fajitas look both easy and delicious! Thanks for the recipe!